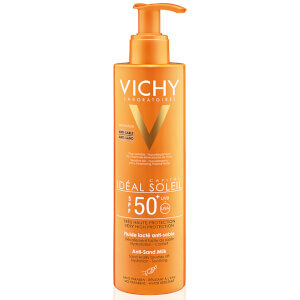 Shield skin from the sun’s harmful rays with Vichy Ideal Soleil Anti-Sand SPF 50; an ultra-protective sun cream with a velvety, non-sticky formula. The SPF50 lotion combines broad spectrum UVA and UVB filters with sensorial textures to ensure a gentle yet effective product that is suitable for all skin types, including sensitive skin. 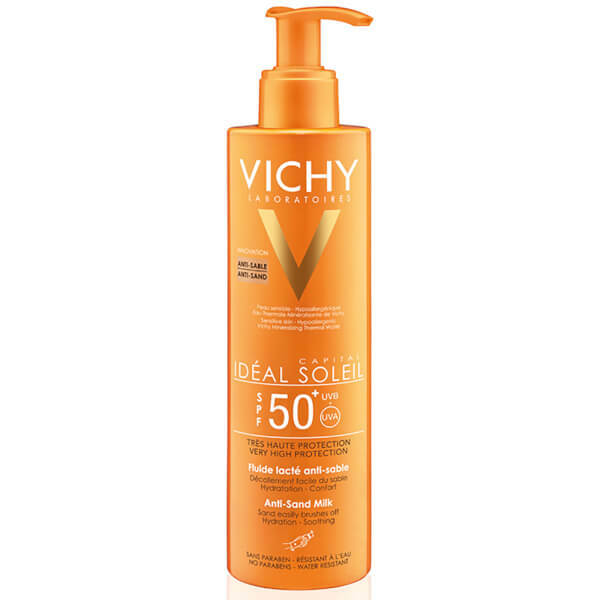 Fortified with a soothing dose of Vichy Mineralising Water, the water-resistant formula delivers a veil of moisture to skin, which keeps skin hydrated and helps to shield it from free radical damage caused when exposed to the sun. Aqua/Water, Dicaprylylether, Homosalate, Octocrylene, Dimethicone, Ethylhexyl Salicyclate, Nlyon-12, Styrene/Acrylates Copolymer, Butyl Methoxydibenzoylmethane, Dicapryl Carbonate, Drometrizole, Trisiloxan, Methyl Methacrylate Crosspolymer, Cyclohexasiloxan, Polyglyceryl-6 Polyricinoleate, P-Anisic Acid, Caprylyl Glycol, Disodium Edta, Ethylhexyl Triazone, Peg-32, Peg-8 Laurate, Phenoxyethanol, Poly C10-30 Alkyl Acrylate, Sodium Chloride, Tocopherol, Parfum/Fragrance.